I enjoy challenging myself and frequently will make something based off an idea or a recipe I have seen having never made it before. 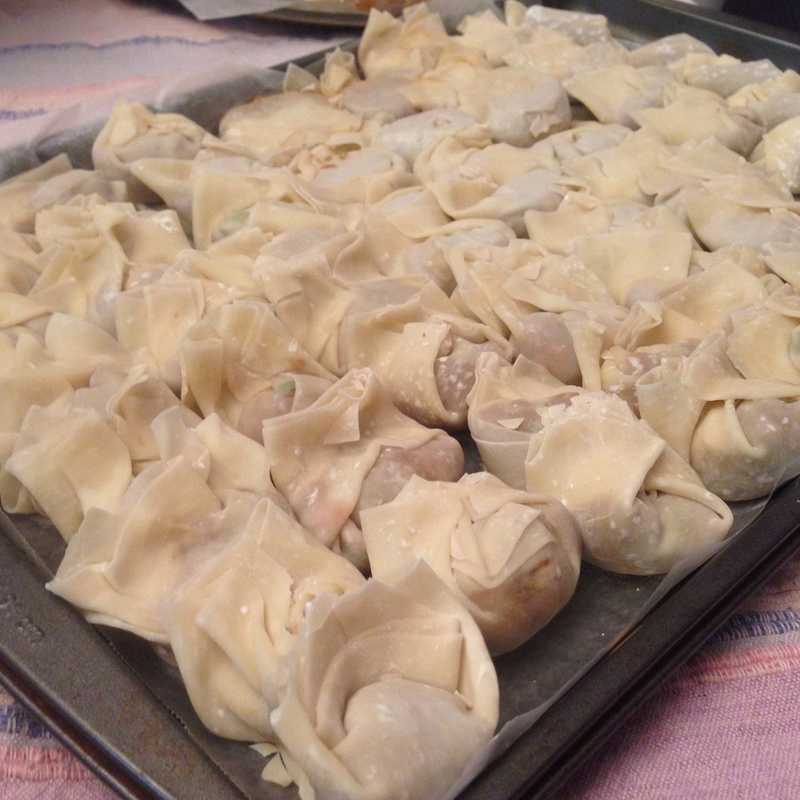 This week is Chinese New Year and I thought, why not try making dumplings? Our friends @munchkinkaty and @scotchguyto also joined in the fun, taking us into Chinatown T&T to get our ingredients (the bad driving due to snow derailed our plans somewhat). 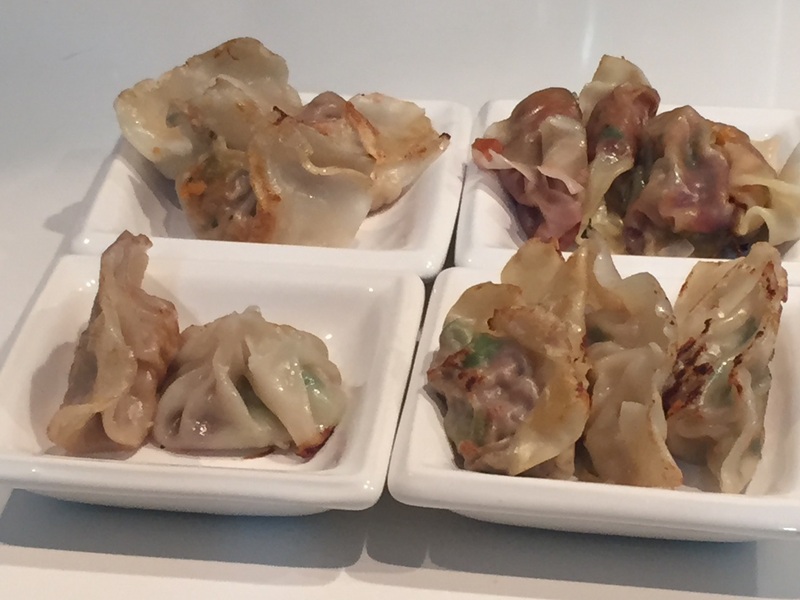 We made four different dumplings: shrimp and scallion, pork, sweet potato and blackberry, and duck and cherry. 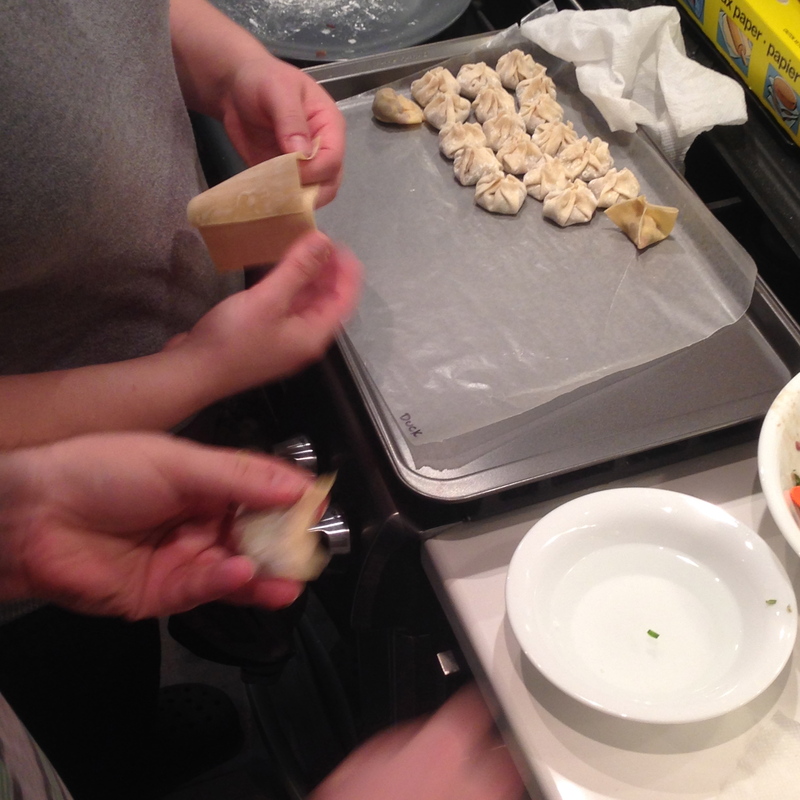 All dumplings were adapted from recipes found online (and listed at the end). The great thing about dumplings is that we could freeze them to eat when we want. It took a while for Katy and I to (kind of) master the folding technique, it became more or less whatever we felt like in the end. 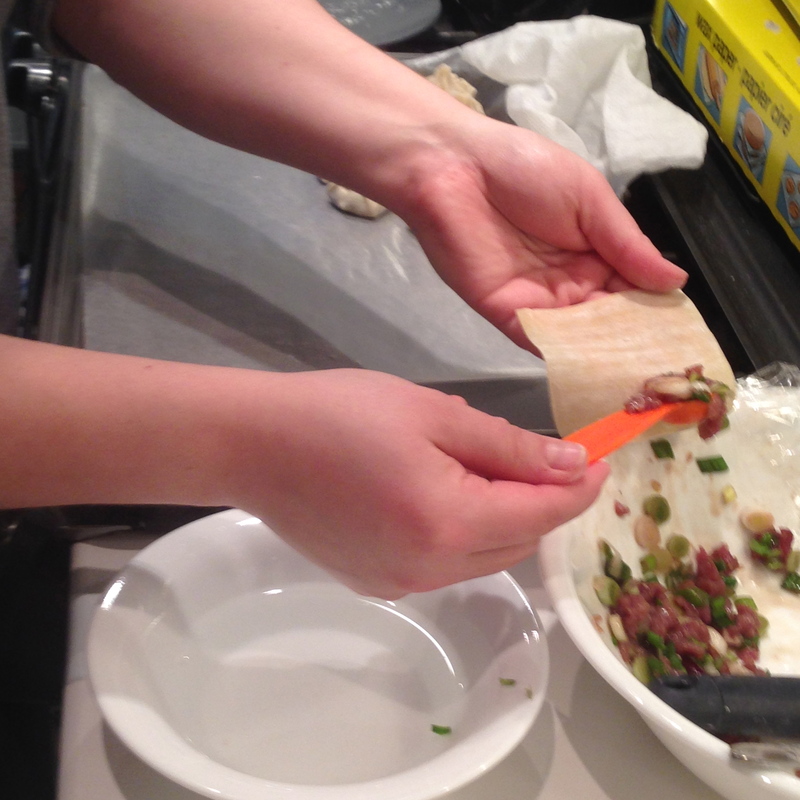 We did manage to fold each type of dumpling differently, which made them easier to identify later when cooking. 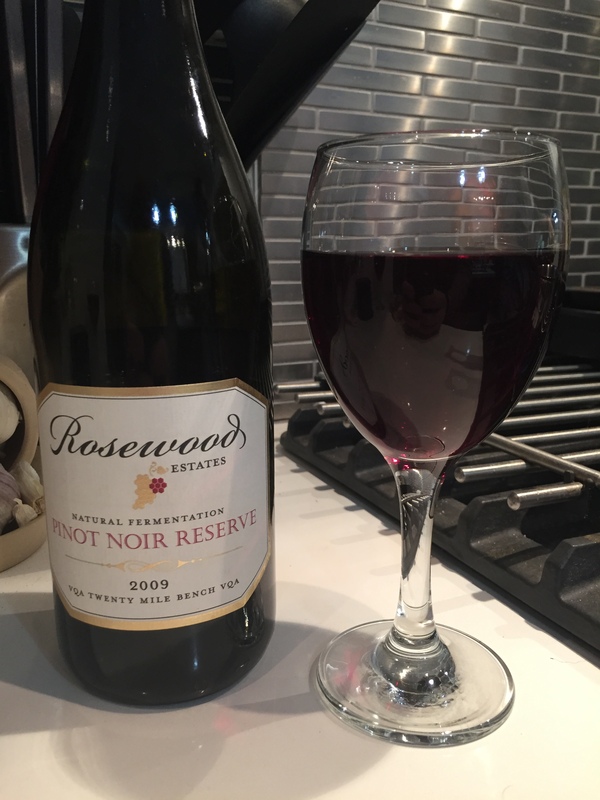 We opened a bottle of Rosewood Pinot Noir Reserve 2009 to complement the flavours, and I think they went well together. A favourite wine and winery of ours, the Pinot nose teases you with cherries and strawberries that are then evident on the palate. After an hour being open, additional berries became evident, such as raspberries and black currants. The colour shows signs of a little bit of age, as the edge is not as red as the centre. The overall colour is more brick red than the usual pigeon blood red. 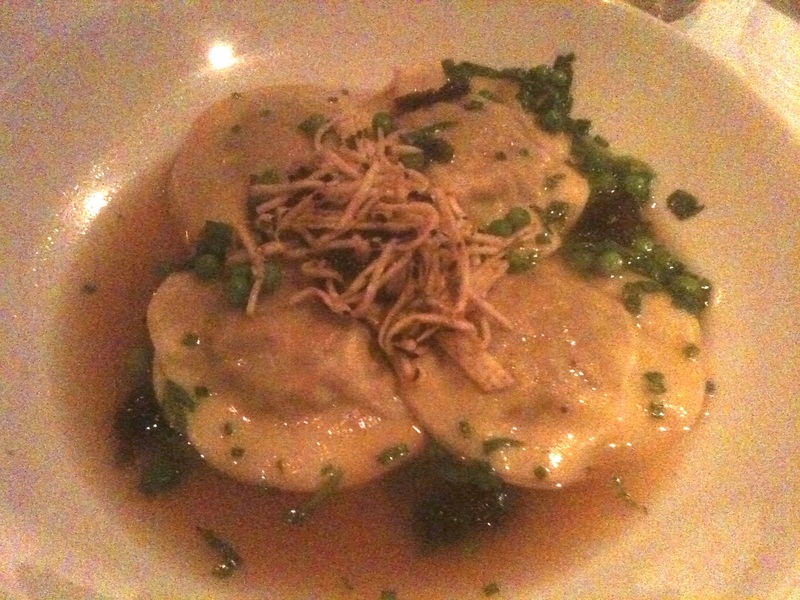 Duck – http://www.bbcgoodfood.com/recipes/1900634/duck-dumplings –> the green onion to duck ratio was large. ‘Small’ bunch of green onions really should be 2-3 onions. Pork – http://allrecipes.com/recipe/chinese-pork-dumplings/ –> The recipe is not divided up well between the dipping sauce and the filling; this is where prepping ingredients is key. Sweet Potato – http://brokeassgourmet.com/articles/sweet-potato-gyoza –> we doubled this and added a half pint of blackberries. It made close to 85 dumplings. Posted in Food, wine and tagged blackberry, Cherry, Duck, dumplings, Pinot noir, pork, shrimp, sweet potato. Bookmark the permalink. 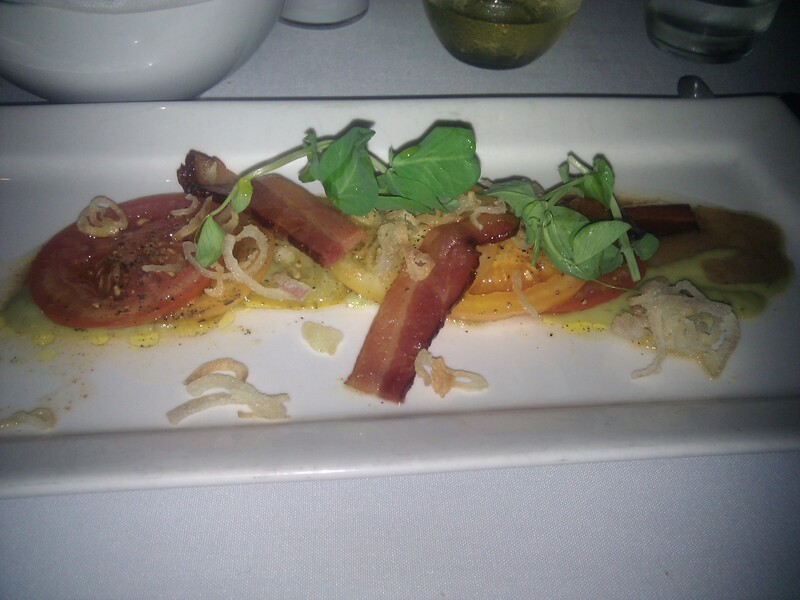 Even though Summerlicious began this year on my birthday, I hadn’t made any reservations. Usually I throw out an open invite to friends, but I have gotten a little tired of none or vague responses. The only reservation I made was ‘on the fly’ as I had seen on Twitter that Trevor (@trevorkitchen) still had some reservations open for the second Saturday night. So off we went to a restaurant that friends had told us was great and that we needed to check out. Trevor is located underground, and on a hot day, this was welcome. I overheard from the table next to us, that it was rated one of the most romantic restaurants in Toronto and the ambiance certainly reflected this. Our waiter Garth was personable and fun but not intrusive, which was welcome. The whole wait staff worked really well together as a team to bring out the food. Though it felt like a quick service, we were there about 2 hours. We started with some white wine instead of cocktails. I had the Salvalai 2010 pinot grigio, from Venezia, Italy and WineGuyTo had the Viña Cobos 2009 “felino” chardonnay, from Mendoza, Argentina. With our meal, I had a glass of Tollgate 2007 “red”, from Niagara (a Stratus Winery label) and WineGuy the Earthworks 2008 shiraz, from Barossa Valley, Australia. 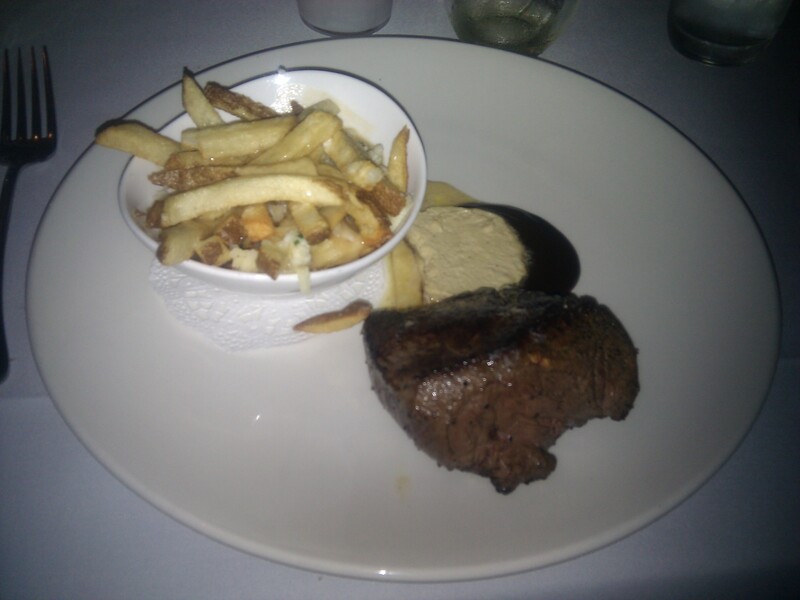 The reds were actually on the house, as they didn’t come to us until mid-way through our mains, instead of at the beginning. I was hooked on the menu once I saw duck, so I got it twice! I started with a seared sea scallop & smoked duck with sweet pea purée & mint crème fraiche and then had the bbq duck ravioli with garlic chive broth & preserved cherries. 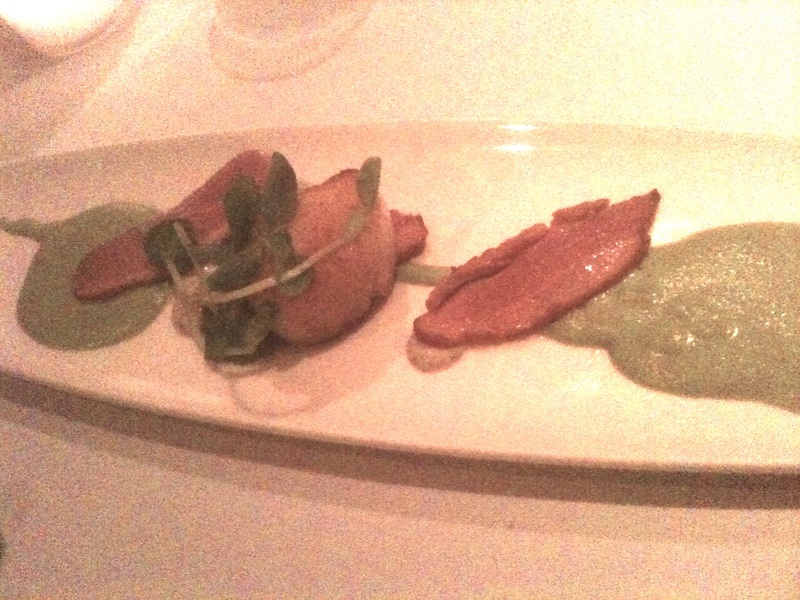 For the appetizer, the scallop was done well and the duck slices were of a nice thickness. The only thing was that I found there was too much of the pea purée, but it was fresh and sweet, so I ate it on its own. The ravioli was tender, spicy and moist. The cherries and chive broth really complemented it. 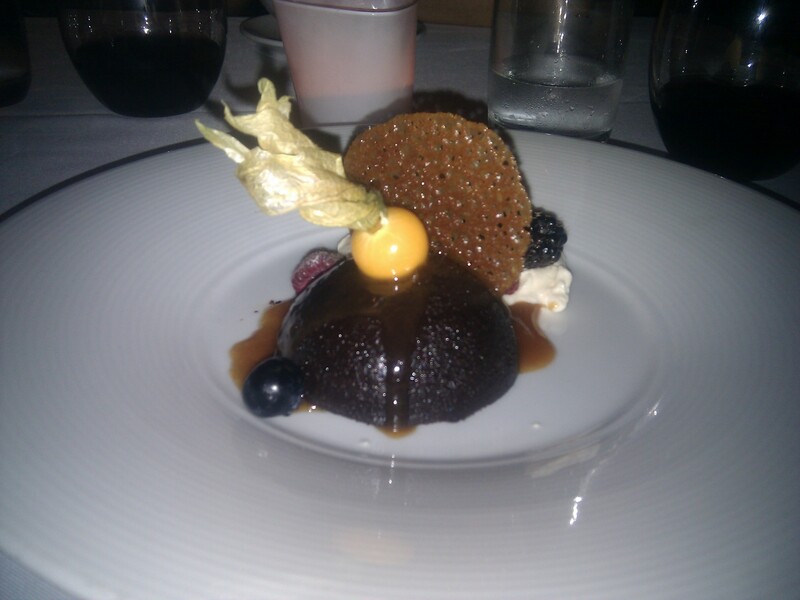 For dessert, I went with the sorbet, which that night was passionfruit, raspberry and blackberry. 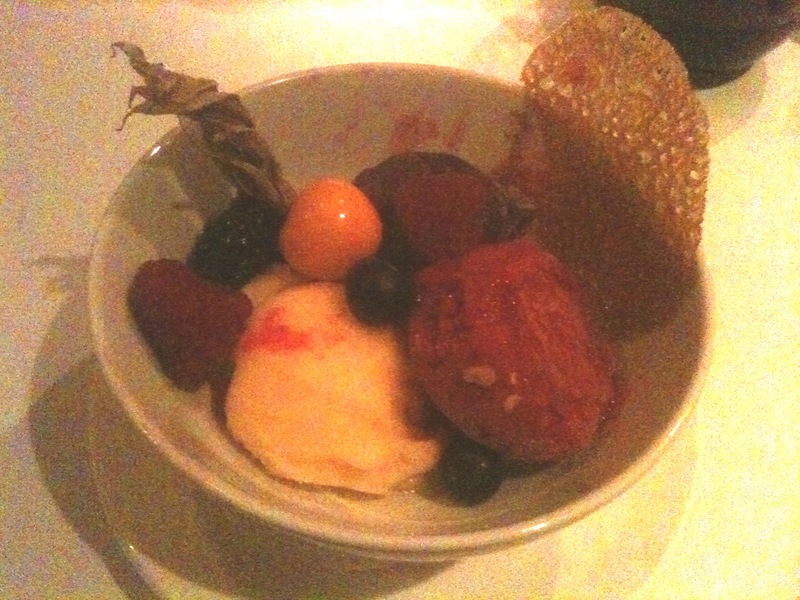 There was also fresh berries on top and the flavours in the sorbet were identical to the berries; so fresh and intense! It would have been nice if it hadn’t been so hard though. WineGuy had the bacon & tomato salad with avocado ranch & crispy shallots to start, the dry aged sirloin with goat cheese poutine & foie gras butter (cooked perfectly rare as asked), and finished with the dark chocolate & caramel torte with peanut butter chantilly. Posted in Restaurants and tagged Duck, Restaurants, Summerlicious, Trevor Kitchen and Wine. Bookmark the permalink.